Whatever happened to Tesco Broadband? While many people still ask about Tesco Broadband, the internet service from the UK’s biggest supermarket is dead and gone. It might seem like an obvious market for Tesco to sell broadband. After all, their SIM Only mobile service Tesco Mobile has been Ofcom’s best rated network for the past eight quarters running. Few complaints, reasonable prices, good customer service, isn’t this everything we’d like to get from our home broadband? But the financials didn’t stack up for Tesco Broadband to continue. 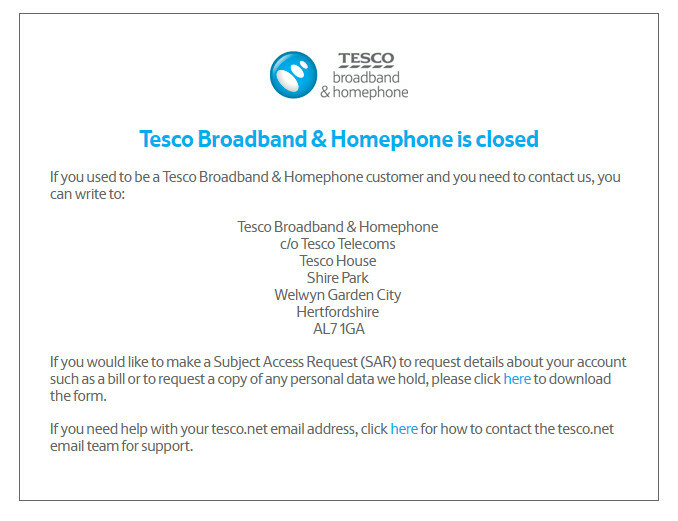 When you visit TescoBroadband.com in 2018, you get a single holding page saying that Tesco Broadband has closed, giving you contact details and a physical address to write to. If you’re a former Tesco Broadband customer and you want to find out anything about your old account, like to see old broadband and phone bills, or to ask Tesco for information they hold on you, you can head to this page and make a Subject Access Request. Tesco still runs email addresses from its tesco.net email service. It’s fairly old hat compared to the free email services available in 2018, including Google’s Gmail. Settings must be changed manually, including IMAP and POP3 to determine whether you keep a copy of emails on the Tesco server or on your home machine. All of this technology has been totally superceded by the likes of Gmail keeping everything in the cloud, so if you switch to a free account nowadays, you’ll likely never have to worry about altering Port 25 or 110 settings. If you need any help with your tesco.net email address or account, you can email support@tesco.net or call 0330 123 4331. Just as happened when the Scottish ISP Tentel collapsed into administration in 2017, TalkTalk bought out that part of the business took over all existing Tesco Broadband accounts. These kinds of company-to-company takeovers are not without their difficulties for consumers like you and I.
BroadbandDeals’s editorial team helped one former Tentel customer get a refund and an apology after months of frustration battling TalkTalk on slow service and an overcharged bill. Tesco announced the sale in January 2015, at a time when the business needed to scale back, closing 43 high-street stores at the same time. All 75,000 customers were told that they would be forcibly moved onto broadband contracts with TalkTalk instead. Customers were given the option – whether it was shouted from the rooftops or not – to switch away from TalkTalk without penalty, but by the force of habit, most remained. Letters sent out to former Tesco Broadband customers from the supermarket said that people would be moved over to TalkTalk for “reasons outside its control”, and said any early termination fees or charges would be waived. These letters also said that if customers didn’t choose to switch away then their broadband would be cut off. These migrations to TalkTalk took a very long time to complete. Some former Tesco Broadband customers said they were waiting over A YEAR before they received letters from Tesco. So that’s it. While Tesco Broadband was popular and had satisfied customers it was not financially viable for Tesco to continue. Dropping their long-term customers into the lap of TalkTalk, consistently Ofcom’s worst-rated provider for reliability and customer service, may not have suited everyone, however.